Universair SA was founded in 1987. Operations began using Boeing 737-300 aircraft on charter flights from Germany, Holland and other points in Europe to Spain. 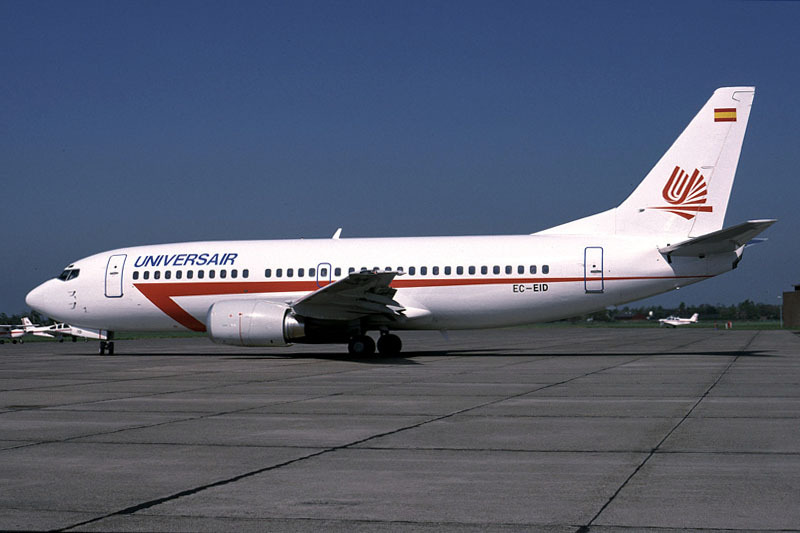 In 1991, UniversAir was integrated into Meridiana. Universair used the IATA code: UN and the ICAO code: UNA. In May 1988, Universair Boeing 737-3T0 EC-EID was photographed at Groningen Airport Eelde in the Netherlands. In the 1988-season, Universair flew on the IT-charters at Groningen Airport Eelde. Boeing 737-3T0 c/n 23941 flew first on 26 February 1988. The airframe was built for Texas Air Corporation as N76360. On 21 March 1988, the airliner was transferred to Aeronautics Leasing Inc. and leased to Universair on 30 March 1988. The Boeing was temporary registered EC-138, before receiving its registration EC-EID in Spain on 29 April 1988. In 1991, Universair was integrated into Meridiana. Boeing 737 EC-EID was transfered to Air Europe and returned in 1992 to the lease company in the USA and entered the US-register as N684WN with Southwest Airlines on 11 May 1992.